Walsh; Lynch, Tresson, Doohan, Tierney; O'Connor, Brien, Smith, Farrell, Fox, Keogh. Subs: O'Brien for O'Connor (68 mins), Kenny for Lynch (70 mins) and Dutton for Smith (73 mins). Assistants: J Ward and JP Kelly. A day where the occasion seemed to effect everyone, the Supersaints stayed focused and got their points which gave them the championship. 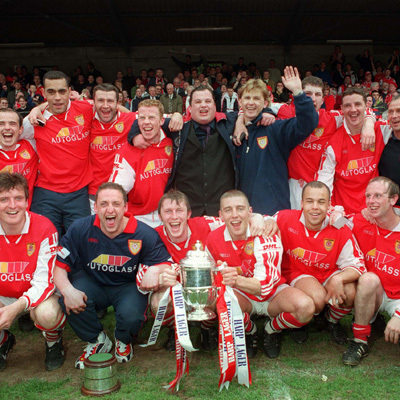 With a record number of points, 19 clean sheets and the League's top scorer on their side, this was a Championship which deserved to reside in Inchicore for another year. Beating their rivals, Cork City, three times over the course of the campaign, it would have been unjust for them not to have picked up the League trophy yesterday. It could have gone that way but Jeff Clarke scoring his first goal of the season made sure the celebrations would be taking place in Dublin and not Cork. It was cruel look for Bray who are now relegated but have the FAI Cup Final to look forward to next Saturday. Bray who needed to win to give them any chance of staying up will feel unlucky that they didn't score. Stephen Fox couldn't direct his header onto Wood's goal, his 30 yard shot crashed of the top of the bar, and Wood produced another tremendous save in the second half to deny Barry O'Connor. With news filtering in that Cork were winning against Shamrock Rovers, St Patrick's pressed on and it was Jeff Clarke who stepped up to slot home a Stephen McGuinness cross after 52 minutes to calm the nerves. As the 'Stadium of Light' erupted the fans knew that they were to be Champions. St Patrick's should have increased the scoring, but fine stops by Walsh denied Molloy on a number of occasions. On the final whistle a see of red and white poured onto the pitch with the party celebrations already in swing.